KFS Engineers listened to top-level competitive shooters, to find out precisely what was needed in a bipod. We used that information to build a bipod that met those needs exactly. Everyone agreed it needed to be rugged, reliable, have a smooth pan and track feature, a smooth tilt feature, tension adjustment until lock for both, and have absolutely no “play” from any of the features. Like most revolutionary gear (red dots, modular forends, muzzle-breaks, enhanced scope rings, match grade barrels ect.) the S7 bipod was tested in competition. Two prototypes were use by top USAMU snipers to compete in, and win, the 2012 International Sniper Competition in Fort Benning, GA. KFS then asked for input from the world class snipers at the competition, and made a few final adjustments to ensure that you, as the end user, would get exactly what you need. 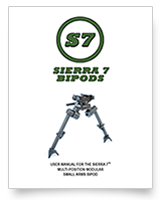 What came about was the final edition of the S7™ bipod. Click the links below for a free digital copy download of the S7 User Manual. We will also be including our retail flyers, and other S7 downloads in the future, as the come available. Be sure to check back often and save is to your favorites! Steel forging is used on the bipod body to increase strength. All springs throughout the S7 bipod are E-coated to prevent corrosion. The innovative clutch-type locking leg design provides maximum contact, while maintaining tight tolerances for ease of use. The inner S7 bipod legs are machined out of High- Tensile Strength AISI 7075 Aluminum Alloy (Type III, Class II). The inner bipod leg is also housed in a .500” deep Santoprene® foot cup. This provides more durability, stability, and protection against harsh elements.